Archery is the art, sport, practice or skill of using a bow to shoot arrows. The word comes from the Latin arcus. Historically, archery has been used for hunting and combat. In modern times, it is mainly a competitive sport and recreational activity. A person who participates in archery is typically called an archer or a bowman, and a person who is fond of or an expert at archery is sometimes called a toxophilite. The bow and arrow seems to have been invented in the later Paleolithic or early Mesolithic periods. The oldest signs of its use in Europe come from the Stellmoor in the Ahrensburg valley north of Hamburg, Germany and dates from the late Paleolithic, about 10,000–9000 BC. The arrows were made of pine and consisted of a mainshaft and a 15–20 centimetres (5.9–7.9 inches) long fore shaft with a flint point. There are no definite earlier bows; previous pointed shafts are known, but may have been launched by spear-throwers rather than bows. The oldest bows known so far comes from the Holmegård swamp in Denmark. Bows eventually replaced the spear-thrower as the predominant means for launching shafted projectiles, on every continent except Australasia, though spear-throwers persisted alongside the bow in parts of the Americas, notably Mexico and among the Inuit. Bows and arrows have been present in Egyptian culture since its predynastic origins. In the Levant, artifacts that could be arrow-shaft straighteners are known from the Natufian culture, (c. 10,800–8,300 BC) onwards. The Khiamian and PPN A shouldered Khiam-points may well be arrowheads. Classical civilizations, notably the Assyrians, Greeks, Armenians, Persians, Parthians, Indians, Koreans, Chinese, and Japanese fielded large numbers of archers in their armies. Akkadians were the first to use composite bows in war according to the victory stele of Naram-Sin of Akkad. Egyptians used composite bows for warfare already from the 16th Century BC while the Bronze Age Aegean Cultures were able to deploy a number of state-owned specialised bowmakers for warfare and hunting purposes already from the 15th century BC. The Welsh longbow proved its worth for the first time in Continental warfare at the Battle of Crécy. In the Americas archery was widespread at European contact. Central Asian tribesmen (after the domestication of the horse) and American Plains Indians (after gaining access to horses) became extremely adept at archery on horseback. Lightly armoured, but highly mobile archers were excellently suited to warfare in the Central Asian steppes, and they formed a large part of armies that repeatedly conquered large areas of Eurasia. Shorter bows are more suited to use on horseback, and the composite bow enabled mounted archers to use powerful weapons. Empires throughout the Eurasian landmass often strongly associated their respective "barbarian" counterparts with the usage of the bow and arrow, to the point where powerful states like the Han Dynasty referred to their neighbours, the Xiong-nu, as "Those Who Draw the Bow". For example, Xiong-nu mounted bowmen made them more than a match for the Han military, and their threat was at least partially responsible for Chinese expansion into the Ordos region, to create a stronger, more powerful buffer zone against them. It is possible that "barbarian" peoples were responsible for introducing archery or certain types of bows to their "civilized" counterparts—the Xiong-nu and the Han being one example. Similarly, short bows seem to have been introduced to Japan by northeast Asian groups. The development of firearms rendered bows obsolete in warfare, although efforts were sometimes made to preserve archery practice. In England and Wales, for example, the government tried to enforce practice with the longbow until the end of the 16th century. This was because it was recognised that the bow had been instrumental to military success during the Hundred Years' War. Despite the high social status, ongoing utility, and widespread pleasure of archery in Armenia, China, Egypt, England and Wales, America, India, Japan, Korea, Turkey and elsewhere, almost every culture that gained access to even early firearms used them widely, to the neglect of archery. Early firearms were inferior in rate-of-fire, and were very sensitive to wet weather. However, they had longer effective range and were tactically superior in the common situation of soldiers shooting at each other from behind obstructions. They also required significantly less training to use properly, in particular penetrating steel armour without any need to develop special musculature. Armies equipped with guns could thus provide superior firepower, and highly trained archers became obsolete on the battlefield. However, the bow and arrow is still an effective weapon, and archers have seen action in the 21st century. Traditional archery remains in use for sport, and for hunting in many areas. The 1840s saw the second attempts at turning the recreation into a modern sport. The first Grand National Archery Society meeting was held in York in 1844 and over the next decade the extravagant and festive practices of the past were gradually whittled away and the rules were standardised as the 'York Round' - a series of shoots at 60, 80, and 100 yards. Horace A. Ford helped to improve archery standards and pioneered new archery techniques. He won the Grand National 11 times in a row and published a highly influential guide to the sport in 1856. Deities and heroes in several mythologies are described as archers, including the Greek Artemis and Apollo, the Roman Diana and Cupid, the Germanic Agilaz, continuing in legends like those of Wilhelm Tell, Palnetoke, or Robin Hood. Armenian Hayk and Babylonian Marduk, Indian Karna (also known as Radheya/son of Radha), Abhimanyu, Eklavya, Arjuna, Bhishma, Drona, Rama, and Shiva were known for their shooting skills. The famous archery competition of hitting the eye of a rotating fish while watching its reflection in the water bowl was one of the many archery skills depicted in the Mahabharata. Persian Arash was a famous archer. Earlier Greek representations of Heracles normally depict him as an archer. Directly drawn bows may be further divided based upon differences in the method of limb construction, notable examples being self bows, laminated bows and composite bows. Bows can also be classified by the bow shape of the limbs when unstrung; in contrast to traditional European straight bows, a recurve bow and some types of longbow have tips that curve away from the archer when the bow is unstrung. The cross-section of the limb also varies; the classic longbow is a tall bow with narrow limbs that are D-shaped in cross section, and the flatbow has flat wide limbs that are approximately rectangular in cross-section. The classic D-shape comes from the use of the wood of the yew tree. The sap-wood is best suited to the tension on the back of the bow, and the heart-wood to the compression on the belly. Hence, a cross-section of a yew longbow shows the narrow, light-coloured sap-wood on the 'straight' part (riser) of the D, and the red/orange heartwood forms the curved part of the D, to balance the mechanical tension/compression stress. Cable-backed bows use cords as the back of the bow; the draw weight of the bow can be adjusted by changing the tension of the cable. They were widespread among Inuit who lacked easy access to good bow wood. One variety of cable-backed bow is the Penobscot bow or Wabenaki bow, invented by Frank Loring (Chief Big Thunder) about 1900. It consists of a small bow attached by cables on the back of a larger main bow. The accurate flight of an arrow is dependent on its fletching. The arrow's manufacturer (a "fletcher") can arrange fletching to cause the arrow to rotate along its axis. This improves accuracy by evening pressure buildups that would otherwise cause the arrow to "plane" on the air in a random direction after shooting. Even with a carefully made arrow, the slightest imperfection or air movement causes some unbalanced turbulence in air flow. Consequently, rotation creates an equalization of such turbulence, which, overall, maintains the intended direction of flight i.e. accuracy. This rotation is not to be confused with the rapid gyroscopic rotation of a rifle bullet. Fletching that is not arranged to induce rotation still improves accuracy by causing a restoring drag any time the arrow tilts from its intended direction of travel. ↑ The noun "toxophilite", meaning "a lover or devotee of archery, an archer" derives from Toxophilus by Roger Ascham —"imaginary proper name invented by Ascham, and hence title of his book (1545), intended to mean 'lover of the bow'." "toxophilite, n." Oxford English Dictionary. Second edition, 1989; online version November 2010. <http://www.oed.com:80/Entry/204131>; accessed 10 March 2011. Earlier version first published in New English Dictionary, 1913. ↑ Zutterman, C. (2003). "The bow in the Ancient Near East. 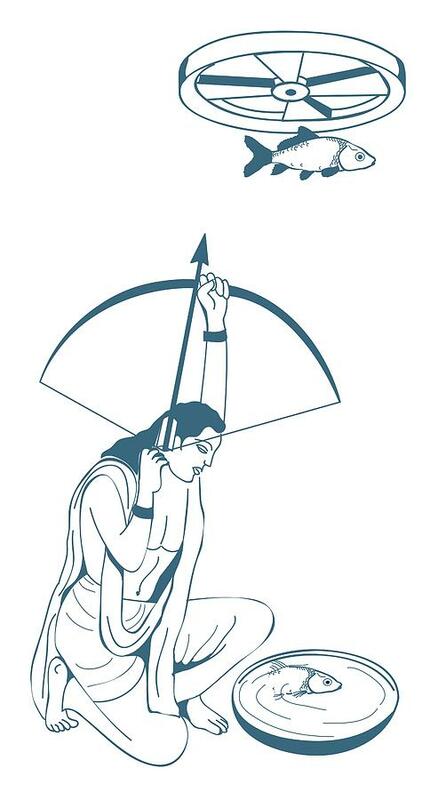 A re-evaluation of archery from the late 2nd Millennium to the end of the Achaemenid empire". Iranica Antiqua. XXXVIII. ↑ Mc Leod, W.E. (Jan 1962). "Egyptian Composite Bows in New York". American Journal of Archaeology. 66, (1). ↑ Bakas, Spyros (2016). "Composite Bows in Minoan And Mycenaean Warfare". Syndesmoi. University of Catania. 4. ↑ Zimmerman, Larry J., 1985 Peoples of Prehistoric South Dakota. University of Nebraska Press, Lincoln and London. ↑ Fehrenbach, Theodore Reed (1974) The Comanches: The Destruction of a People. Knopf, New York, ISBN 0-394-48856-3; republished in 2003 under the title The Comanches: The History of a People. New York: Anchor Books. ISBN 1-4000-3049-8. ↑ "About Us - Club History". Ancient Society of Kilwinning Archers. Archived from the original on 2 February 2017. Retrieved 24 January 2017. ↑ Norton, William. "Royal Company of Archers". Yeomen of the Queen's Body Guard. Retrieved 24 January 2017. ↑ "Royal Toxophilite Society". Longbow Archers. Retrieved 24 January 2017. ↑ Johnes, Martin. "Archery—Romance-and-Elite-Culture-in-England-and-Wales—c-1780-1840 Martin Johnes. Archery, Romance and Elite Culture in England and Wales, c. 1780–1840". Swansea.academia.edu. Retrieved 2013-03-26. ↑ "The Royal Company of Archers". Archived from the original on 25 November 2012. Retrieved 17 December 2012. ↑ "Archery results - Pari 1900". olympic.org. Retrieved 11 June 2014. ↑ "Nymphai Hyperboreioi at Theoi Greek Mythology". Theoi.com. Retrieved 26 March 2013. ↑ The Penobscot War Bow. Gordon M Day. Contributions to Canadian Ethnology 1975. Canadian Ethnology Service Paper no. 31. ISSN 0316-1854. Ottawa 1975. ↑ "99% Let Off Bows". Concept Archery. Retrieved 26 March 2013. ↑ "Ketoh". Millicent Rogers Museum of Northern New Mexico. Archived from the original on 8 September 2008. Retrieved 6 May 2009. ↑ "What is eye dominance? Why does it matter for my first bow?". Discover Archery. Easton Foundations. Retrieved 24 January 2017. ↑ Deprospero, Dan and Jackie. "One Point Lessons: A collection of simple lessons and explanations of Kyudo technique". Meishin Kyudojo. Retrieved 24 January 2017. ↑ St. Charles, Glenn. Billets to Bows. ISBN 978-0965139403. ↑ "The Physics of Archery AstraZeneca Science Teaching Trust". Docstoc.com. Retrieved 26 March 2013. ↑ "Archived copy". Archived from the original on 5 January 2015. Retrieved 12 February 2015. ↑ "Para Archery". World Archery. World Archery Foundation. Look up archery in Wiktionary, the free dictionary.